The first Roman Catholic Church was established in the Mission Room overlooking the Iron Works built c1880 demolished in 1969. The Mission Room was a Mass Centre also known as a ‘Chapel of Ease’ to the Roman Catholic parish church of St. Joseph in Aberdare and served from there. It was built to accomodate the increasing number of Catholics coming into the area for employment, and to save them the inconvenience of travelling to Aberdare church, with no easy transport to take them there in those days. 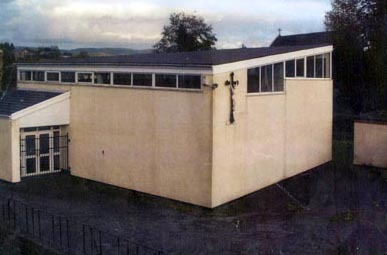 The present day Church was built in 1965, dedicated in 1966, opposite St.Lleurwg’s Church Station Road, adjacent to the site of the former Soar Welsh Weslyan Chapel. I am able to share this view after visiting the somewhat outlying location of the site accompanied by Mr. Tom Brookman of Hirwaun, a catholic of the parish since the 1930′ s. In 2007 Mr. Brookman showed me the site of the old 1880 R.C. Mission Room, the stone rubble and foundation remains of which are just visible above ground level, almost completely hidden by over forty years of overgrowth since its demolition in c1969. Later, Mr. Brookman provided me with a rare postcard photograph (as shown above) entitled – ‘A Pretty View in Hirwaun ‘ – dated circa 1905, clearly showing the Mission Room overlooking the ironworks with earthen bank sloping down to the river Cynon and Pistyll (trans. Water Spout; Well). Penhow houses and vicarage are nearby to the south. The row of four terrace houses at Bute Place, Penderyn Road is shown adjacent to the bridge near the Pistyll. The ironworks are visible as is the stack of the former N.B. Alien Brickworks in the far background. Also in the background distance is Tudor Terrace. Photograph taken c1905. The 1880 R.C. 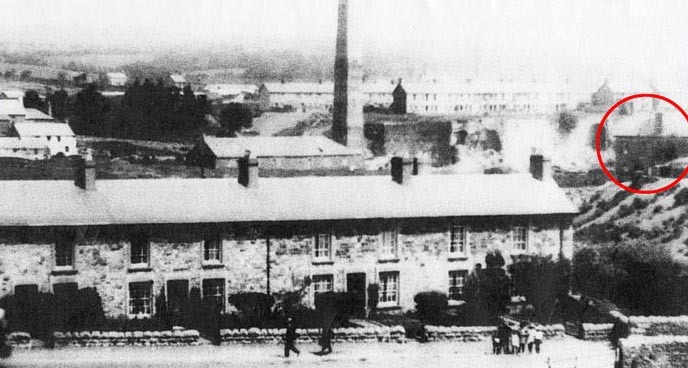 Mission Room is shown circled with Bute Place and Penderyn Road in the foreground. Photograph Courtesy of Mr Tom Brookman.